“Dear Sir. Are you booked for May 16.85 p.m.? We open our grounds that day and would like to arrange Exibition game. Let me hear from you and oblige”, reads the innocuous-looking card with its slight misspelling and copper-plate script. Addressed to the manager of the Harvard B. B. 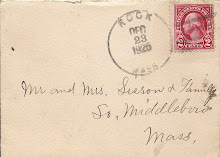 Club at Cambridge, the card is signed by G. E. Wood, secretary of the Middleboro B. B. Association, whose signature appears alongside that of J. H. Willoughby, “Manager”. Though initially somewhat mysterious, the postal card is one of the pieces of ephemera relating to early baseball history in Middleborough. 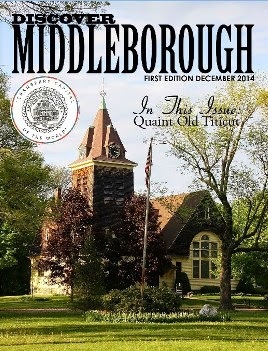 While Willoughby and Wood were well-known Middleborough figures in their day, modern residents might be forgiven if their names are today slightly less familiar. 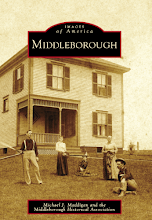 Willoughby, though manager of the “Middleboro Base Ball Association”, was more prominent in town in 1885 as the principal of Middleborough High School. Willoughby, in fact, was perhaps the most successful principal of the school prior to the long-tenured Walter Sampson. Through Willoughby’s efforts, the school, which previously had had a tenuous existence, was established on a firm footing and evolved into a well-respected institution within the community. The Baseball Association appears to have been just one of Willoughby’s many interests outside the high school. Willoughby’s counterpart as secretary of the local Association was George E. Wood who resided first on Courtland Street and later in his father William Bourne Wood’s house on South Main Street in Middleborough. 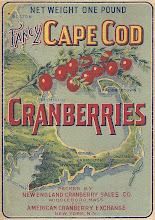 Wood, who was twenty-nine at the time he sent the postal card to the Cambridge club, had worked as a flour merchant with James F. Edmunds & Company of Boston before becoming a partner in the firm of Sands, Taylor and Wood which also dealt in flour. 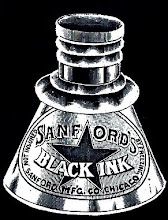 By the close of the 1880s, Wood had entered a new partnership with his brother Charles A. Wood, operating the boot and shoe retail firm of Wood Brothers on Center Street until 1895. Wood, as secretary of the Association, would have been responsible for promoting its welfare and he was well-suited for this role, appearing to have been a natural-born booster. 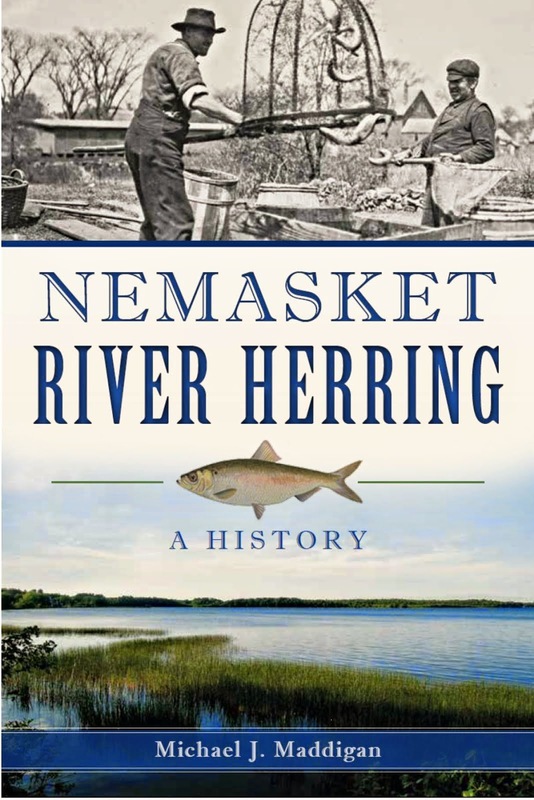 “As a salesman, he displayed a remarkable business ability and his rise in the commercial world was rapid,” wrote Mertie Romaine of Wood in her History of the Town of Middleboro. 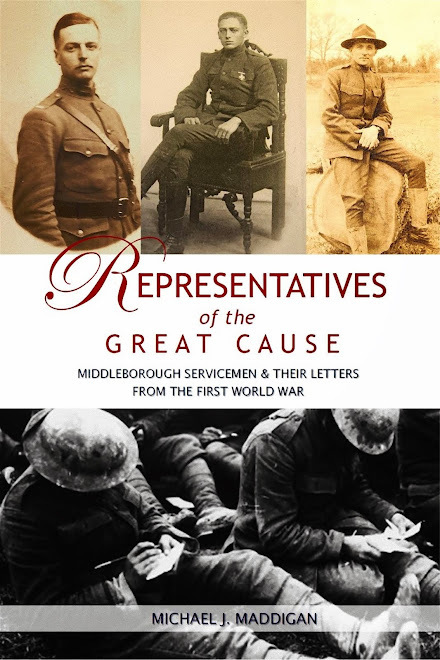 In addition to promoting the interests of the Middleboro Baseball Association, Wood was prominent as a promoter of the electrification of Middleborough’s streets and the business of the LeBaron Foundry Company on Vine Street. Additionally, Wood was influential in the physical relocation of the Unitarian Church building from Pearl Street to a much more visible location on South Main Street. One of Wood’s earliest tasks as the Association secretary involved the promotion of an exhibition game for the opening of the club’s new grounds which were likely located on North Street. Previously, the town’s principal baseball field had been located at the corner of Center and Pearl Streets on the site now partly occupied by a Cumberland Farms. The growth of the immediate neighborhood, however, was not conducive to the continued presence of a baseball field. Reports from the era which record fly balls sent across Center Street crashing through the windows of Leonard & Barrows' shoe manufactory and line drives being hit into passing carriages hint that the field was probably seen as a growing nuisance in the increasingly congested district. As a consequence, new grounds removed from the immediate center of the town were secured. Clearly, the field seems to have been the first leased by the Association in hopes of establishing a permanent home for the club. Little else may be gleaned from the pithy news item, though the location of the grounds was likely on North Street where bleachers were proposed. (Previously, spectators had stood along the base lines to watch games). 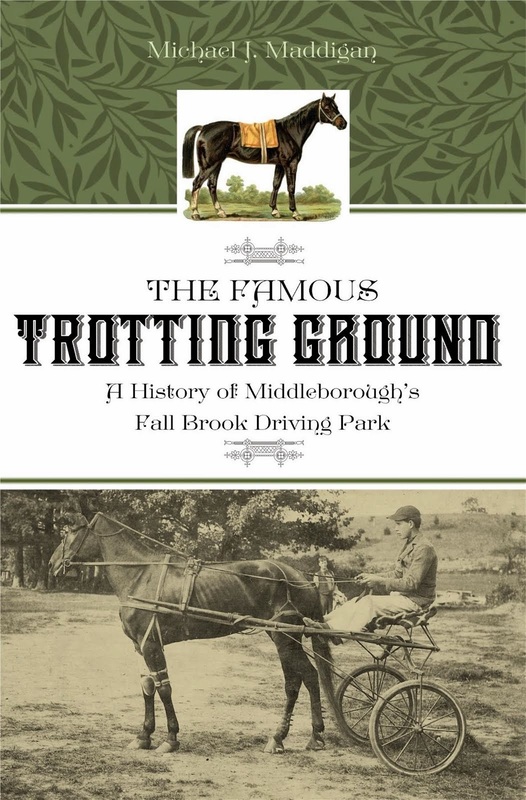 Certainly by the turn of the century, Middleborough’s semi-professional teams were using a location on North Street as their homefield. While there is no further local record of the opening of the grounds, nor any record as to whether Harvard University’s prestigious baseball club ever “obliged”, the field’s opening day was undoubtedly surrounded by great public display. Particularly during the late nineteenth century, baseball was an integral part of holiday and other celebrations and was an avidly followed sport (which consequently earned for it its title as “America’s Pasttime”). The opening of the Baseball Association’s new grounds therefore was doubtless attended with much publicity and fanfare. 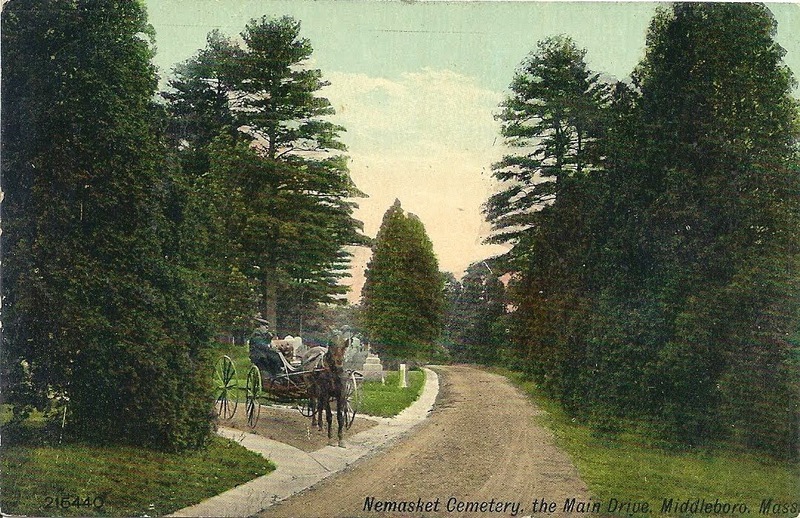 The simple postal card pictured above sent to the manager of the Harvard Baseball Club at Cambridge, is one of the few items dating from the late 19th century which relates to the establishment of baseball grounds by the Middleboro Base Ball Association. 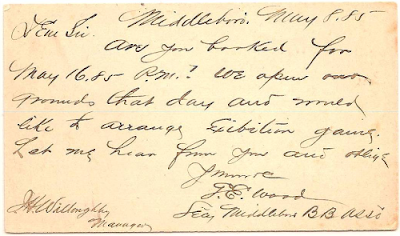 In it, the secretary of the local association, George E. Wood requests the presence of the Harvard team for the local field’s opening day on May 16, 1885.